Cave Art Hotel orijinalini koruyarak restore edilmiş bir taş yapı içinde inşa edilmiştir. Kasabanın panoramik manzarasına sahip teras restoranı bulunan tesis, ses yalıtımlı odalar sunmaktadır. Cave Art Hotel kemerli tavan içeren taş odalar veya orijinal mağara odalar bulunuyor. Her oda geleneksel Osmanlı, Selçuklu ve Hitit stilinde dekore edilmiştir. Bazı odalarda ayrıca özel bir spa küveti de mevcuttur. Ideally situated on a small hill overlooking the historic centre of Sinasos, this elegantly restored old Greek house offers superb views of the carved stone houses of the picturesque village below. In the intimacy of the 7 thoughtfully-decorated cave and arch rooms and suites - each with its individual furnishing theme - you will discover beauty, nature, culture and comfort. Facilities include a beautiful flowered courtyard and roof terraces for breakfast and dinner.Telephone, mini-bar, satellite LCD TV, tea and coffee making facilities are available in all rooms and all bathrooms have jacuzzi, hairdryer, bathrobe and slippers. Wireless internet access is available in communal areas. Doğal güzellikleri ile görenleri büyüleyen Kapadokyanın Ürgüp Mevkiinde yer alan Elif Stone House, konforlu odaları ile misafirlerini ağırlıyor. Tesisin konforlu odalarında; karşılama tepsisi, minibar, LCD TV ve makyaj aynası bulunuyor. Tesiste ücretsiz kablosuz internet ve otopark mevcut. Açık yüzme havuzu bulunan tesiste misafirlere serinleme imkanı sunuluyor. Hotel Amenities The hotel offers a restaurant. A bar/lounge is on site where guests can unwind with a drink. Guests can enjoy a complimentary breakfast each morning. Public areas are equipped with complimentary wired and wireless Internet access. 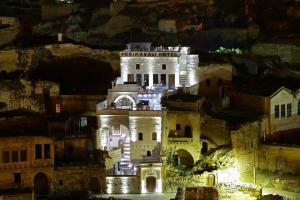 This Urgup hotel also offers a terrace, tour/ticket assistance, and barbecue grills. For a surcharge, a roundtrip airport shuttle (available on request) is offered to guests. Onsite self parking and valet parking are complimentary. Acropolis Cave Suite has designated areas for smoking. 24-hour front desk Airport transportation (surcharge) Total number of rooms - 12 Bar/lounge Barbecue grill(s) Coffee/tea in common areas Free breakfast Concierge services Dry cleaning/laundry service Designated smoking areas Tours/ticket assistance Free WiFi Free wired high-speed Internet Laundry facilities Free valet parking Garden Terrace Luggage storage Restaurant Free self parking Television in common areas Family Friendly Amenities Family Hotel Free Wi-Fi Laundry facilities Cribs/infant beds (complimentary) Internet Available in all rooms: Free WiFi Available in some public areas: Free WiFi , Free wired high-speed Internet Parking Free self parking, Free valet parking Room Amenities Premium TV channels Coffee/tea maker Free bottled water Daily housekeeping Bathrobes Free toiletries Hair dryer Slippers In-room safe Electric kettle Satellite TV service Free WiFi Room service (24 hours) LCD TV Free cribs/infant beds Rollaway/extra beds (surcharge) Where to Eat A complimentary buffet breakfast is served each morning between 8 AM and 10:30 AM. Onsite venue - This restaurant serves breakfast only. Open daily. Nearby Things to Do The recreational activities listed below are available either on site or nearby; fees may apply. Horse riding/rental on site Check-in Minimum check-in age is 18 Special check-in instructions: Airport shuttle service is available on request during limited hours. Contact the property in advance to make arrangements. Check-out Check-out time is noon Children and extra beds Children are welcome. Kids stay free! Up to 6 children 1 years old and younger stay free when using existing bedding. Rollaway/extra beds are available for EUR 20 per day. Free cribs (infant beds)! Pets Pets not allowed (service animals welcome) You need to know Extra-person charges may apply and vary depending on property policy. Fees You'll be asked to pay the following charges at the property: Airport shuttle transfer per adult: EUR 10 (roundtrip) We have included all charges provided to us by the property. However, charges can vary, for example, based on length of stay or the room you book. Optional extras The following fees and deposits are charged by the property at time of service, check-in, or check-out. Airport shuttle fee: EUR 10 per person (roundtrip) Rollaway bed fee: EUR 10 per day The above list may not be comprehensive. Fees and deposits may not include tax and are subject to change. We should mention Up to 2 children 1 years old and younger stay free when occupying the parent or guardian's room, using existing bedding. 2004 yılından bu yana aile tarafından işletilen Crazy Horse Pension, restore edilmiş 300 yıllık bir mağara evinde hizmet vermekte olup geleneksel mimariye sahiptir. İl Özel İdare desteğiyle restorasyon yapılmıştır. Kapadokya'ya özgü taş evlerde keyifli bir konaklama ve bölgenin zengin coğrafyasını, kültürünü yakından tanıyabileceğiniz bir tatil için Crazy Horse Pension sizleri bekliyor… Tesiste şehirden nefes kesen manzaralar sunan bir teras ile bahçe mevcuttur. Oda kahvaltı olarak konuklarına hizmet veren Crazy Horse Pension'da dilerseniz yöreye özgü lezzetlerin sunulduğu mutfaktan akşam yemeklerinizi alabilirsiniz. Tesiste, tek ve çift kişilik odaların yanı sıra aile odaları da bulunuyor. Tüm odalarda uydu bağlantılı TV, ücretsiz wi-fi ve özel banyo bulunuyor. Crazy Horse Pension Kapadokya'da merkezi bir konaklama yapmak isteyenler için de en ideal konaklama mekanı. Ortahisar'ın merkezinde bulunan tesis Ürgüp'e yalnızca 5 dakikalık mesafede yer alıyor. Crazy Horse Pension olarak turlar düzenliyoruz. Sadece ay ışığında, doğanın gizeminde Kapadokya'nın en görkemli Kızılçukur mevkisinde 3 saatlik doğa yürüyüşleri düzenliyoruz, dönüşte sıcak şarap ikramlarımız oluyor. Tesiste her gün açık büfe kahvaltı servis edilmektedir. 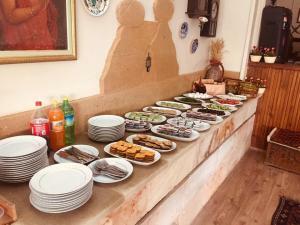 Otel bünyesindeki restoran, öğle ve akşam yemeklerinde açık olup Türk mutfağından değişik geleneksel lezzetleri tatma imkanı sağlamaktadır. Parkur 9 kilometre olup, istenildiğinde 6 kilometreye düşürülebilir. En az 4 kişi olması gereklidir. Crazy Horse isminin sahibi atımız Zeyna bize bu turda eşlik edecektir.